I’ve got some chops. Sort of. 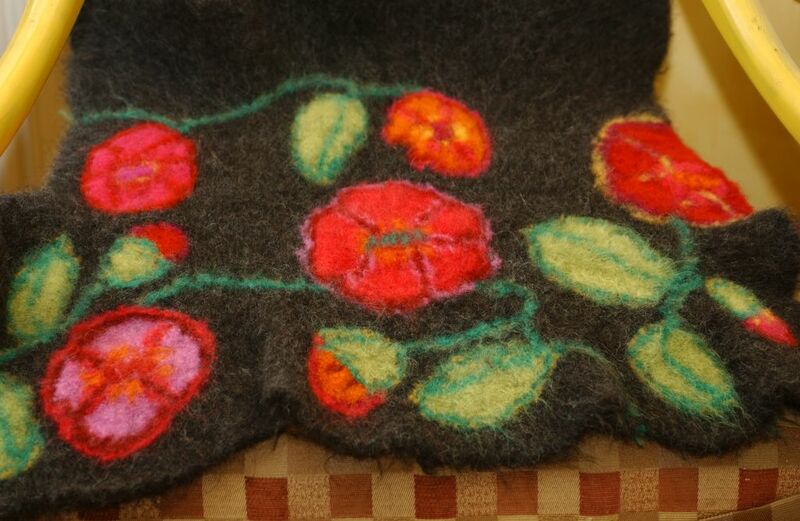 Here is a detail of an almost finished WIP. 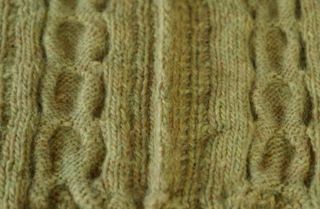 It is the Modern Family cardigan from Knitting Today’s Classics ISBN#:1-887374-36-1 From the Studios of Classic Elite/Kristin Nicholas. I am in a cardigan kind of mood. I love ‘em. I wear cardigans with everything from pyjamas to cute little skirts. I bought the yarn, Pastaza, from kaleidoscope yarns and I love it and they were wonderful to do business with. 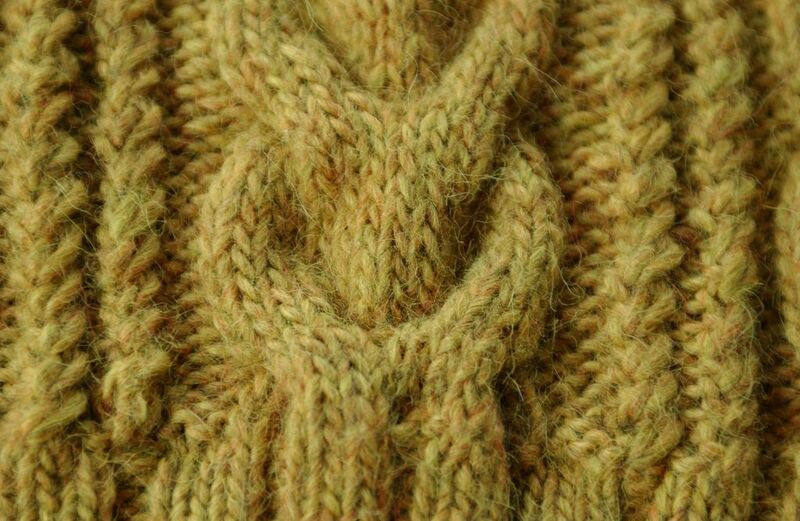 The yarn knit up beautifully. I love the definition of the cables and the twists. 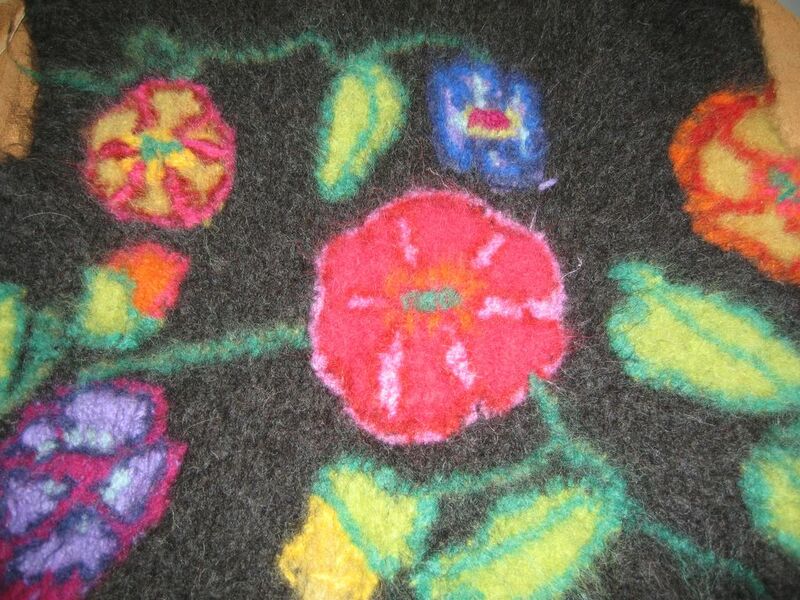 There were two adjustments I made to the original pattern by Linda Pratt. She called for Le Gran Mohair and in the pattern she called for a twist 5. I wasn’t crazy about how the TW5 looked so I did a 5 st repeat that was a TW2 P1 TW2. If I do say so myself, this is some pretty spiffy mattress stitch. I don’t know that it is Ann & Kay worthy, but a girl can dream, can’t she? So, all I’m saying is that I can get my way around a pattern. Or so I thought. 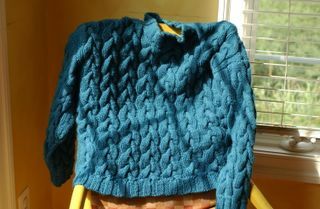 Usually I am a sew the button band on kind of gal, but this time I did the pick up and knit. Ufff. Pffft. Yuck. We have serious floppage. Now this is an unblocked button band so I will attempt to flatten. I do not think it will work with my trusty iron. I am seriously considering unsewing the entire shooting match and giving it a nice soak and repinning the whole thing. Note to self: do not fib about current body size- your sweater will be a bit snug. Erff. I will keep you posted. I loved knitting this sweater and finally taught my self how to cable without a cable needle thanks to this very generous gal. I think this may be a loser, but I will try my hardest to make it a winner. I made this sweater for Craig years ago. For our second Christmas together. It is Tyrone from Rowan Number 22. I made it out of some acrylic. Encore? I think. The drape really is lovely and the hand is awesome. Craig is very susceptible to Itchy Sweater Syndrome and I wanted to make sure that he would wear it. I used the yarn doubled. And it is wall to wall cables. This sweater weighs, no joke, about 12 pounds. And I shortened it by about 5 inches. I’ll bet those five inches would have added about 4 more pounds! I knew the color was a favorite of Craig’s though at the time I wasn’t so sure. Actually I disliked it. A lot. But I knew he would love it. And he did. And does. And the color has grown on me. The problem is that I married a polar bear. Growing up in the horrid, cold, death trap that is Thunder Bay, Ontario the man can go out in literally freezing temperatures in a tee shirt and jeans. He has worn the sweater four times in six years. I do not fault him for this. The first time was when I gave it to him. Bonus points for showing enthusiasm! The second time was about a week later when I made him haul all 12,000 pounds of the sweater to my parent’s for Christmas. In Malibu. It was 70 degrees, inside the house. He wore that sweater the whole morning. Triple bonus points! When I noticed he was a little warm (the big indicator was that he was turning violet and sweating profusely) I told him it was okay to take it off. I do not think that I have ever seen the man more grateful. The third time was when I was pregnant with Angus and Craig walked the dog at about 5am. It was winter in Seattle and was a little icy and cold and damp. Still, I had to persuade him to wear it, and he did. This is how it got its name: “The Dog Walking Sweater”. The only time he can wear it reasonably comfortably is in the pre-dawn really chilly times. Like when the dog HAS to go at five in the morning. The last time he wore it was this winter. It was about 22 outside and he put it on to play in the snow with the boys. Bless him, he even wore the toque that I asked him to wear. He won’t let me frog it. I have offered. He refuses. He loves it, he just doesn’t love to wear it. And I used to take it personally, but I do not anymore. I take those four times he has worn it as a love letter. A statement that I am his and he is mine and we have the beautiful, enormously heavy sweater to prove it. That’s I think a large part of what love is. Doing what makes the other person happy, makes you happy. And now I would never dream of frogging it. Everytime I see it now, I remember how much he loves me. Happy Anniversary Baby! Seven of the greatest years of my life. I’m here! I’m here! Okay, I am a little late to the party and I am finally here. Traffic? Small hollering boys? A clothing fit? Pick any of the following reasons, they all tried to keep me away- nonetheless I have finally arrived to the knit-blogging party. And boy am I happy to be here. Mmm, why yes- I will have one of those, thank you. Delicious. May I have another? Thank you. I have been knitting since I was well, er, younger. It all blurs in memory- was I eight, was I fourteen? Doesn’t matter- it has been a long time. I wore that horrid purple tweed curling (stockinette stitch) scarf for ever. I got really serious when all those fantastically fabulous ladies at Straw into Gold took me under their wings and explained to me many, many things. Gauge in particular was a very humbling lesson. I was all of 21(?) And I was making a cotton bolero from a VK Summer in the late eighties. The one with the drops at the cast-on edge. The one that after 2 babies in 29 months I would rather eat glass than wear. I had knit about half a sleeve- soon after this I learned the 2 sleeves at once trick- and with great pride I showed my half sleeve to a woman who was an expert knitter. She asked very gently (she was a kindergarten teacher) if I had checked my gauge? Gauge? Huh? What? The answer would be “No” as I had not a clue as to what gauge/tension was. Now, as much as I kvetch about it I always make a swatch. Sometimes several until I get it right. Sometimes when I do not know what to knit, I just make swatches from my stash and use those little cardboard tags (like the ones at garage sales) to note the yarn, needle size and gauge, etc. then I save them for when it is time to make a garment. Handy, very handy. I have knit many things that I love some that I don’t (wear). Several have found new homes. I have made blankets, hats, sweaters, scarves, bags. No mittens or socks yet. I have a UFO that I have known longer than my husband and we are about to celebrate our 7 year anniversary. 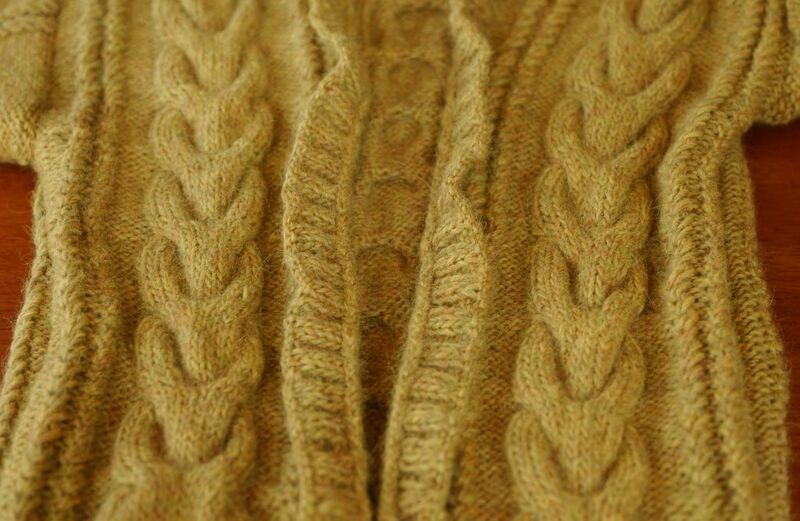 Actually, I started the sweater (Alice Starmore Celtic Circles- in Red and 2 shades of orange) 6 years before I married him! That is a 13 year old UFO. Crikey! 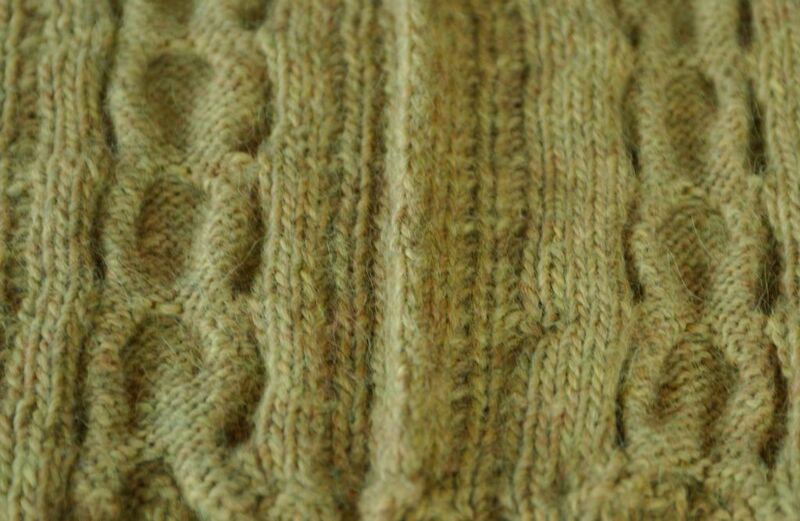 I am ¾ of the way up the armhole steeks, so I am not going to quit now! So here are my latest FOs. I wanted to start this blog before I started this really fun project but felt like I needed to present my invitation at the door, if you know what I mean. So I made 2 Weekend Getaway Satchels from IK Fall 2005. Two? Yes, two. One for me and one for my best girlfriend from college. Here are pictures of the fronts of both. Hers is first, with the blues and purples and mine is the one in the hotter colors. Hers is done, gifted and will hopefully be seen around town very soon. All I have to do for mine. is wait for it to dry, cut it to size, sew in the double lining, do the hex closure and the straps and I am finito! I will do a debrief for the bags tomorrow. I will say, it was a really fun project and I learned a bunch. Feeling kind of invincible. Like the first time I took both boys to Costco by myself. Yea, baby- I can do anything!